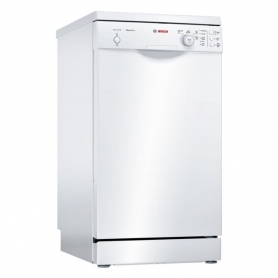 This freestanding dishwasher, available in white with a stainless steel interior, combines efficient performance with a user-friendly design. It’s also exclusive to Euronics and Agent stores, so you won’t find this fantastic model anywhere else. Featuring a wash rating of ‘A’, the DFS05C10W will leave your crockery sparkling clean in one wash. You’ll also find it fully dry from the static drying method, which has an impressive efficiency rating of ‘A’ too. This top-rated functionality eliminates the need for handwashing, delivering spotless results every time. 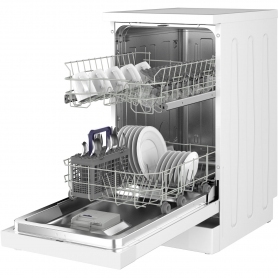 There are 10 place settings in this Beko dishwasher, so you can add all of your plates, bowls and cutlery hassle-free. Loading the machine is also simple thanks to the counterbalanced door, which stays in place once opened. Plus, you’ll find a fuss-free control dial and buttons, which offer total clarity when choosing settings. Once you’ve started a wash, handy LED progress indicators even show the stage of the cycle. 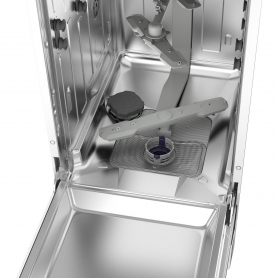 The Half Load function is ideal for when you have fewer items to wash, saving time and energy. Or, if you’re in a hurry, the quick Mini 30 programme washes a full load of lightly soiled dishes in just half an hour. 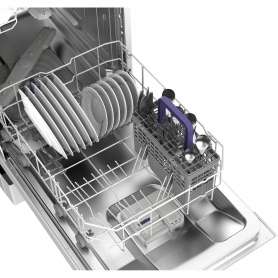 For fast and thorough results, the Quick&Shine programme washes a full load of dirty dishes in just 58 minutes. 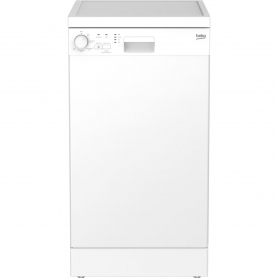 Measuring H85 x W44.8 x D60 cm, this slimline Beko dishwasher will fit into your kitchen or utility room effortlessly. The DFS05C10W is even energy efficient, with an annual energy usage of just 237 kWh and A+ energy rating, so you can save money on your utility bills. 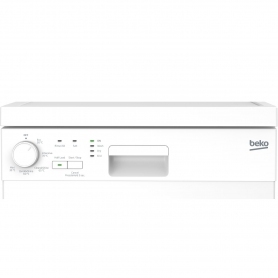 If you’re looking for a dishwasher with powerful yet efficient performance, the Beko DFS05C10W is the perfect choice. Buy yours today.